Companies today need a robust and secure enterprise collaboration solution to strike a balance between productive collaboration and enterprise-level security. But where to begin? What are the questions organizations should be asking? 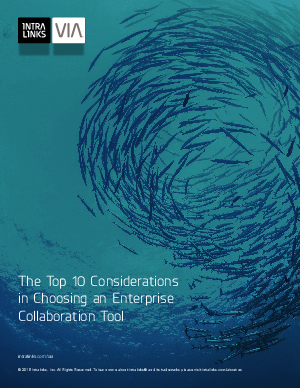 Download The Top 10 Considerations in Choosing an Enterprise Collaboration Tool. We’ve put together some key factors in determining the right solution to get you started. Your collaboration goal is simple: control access to information while enabling employees to get work done. Getting there is not so simple – with the growing infiltration of BYOD and consumer-grade file sharing applications into the enterprise.